It was late on in 2014 when I was hearing the news the one of the UK's highest respected ukulele acts was putting together some recordings for release. I owe both him and my readers something of an apology for being a little behind the curve on this, as I've actually had Phil's new EP in my possession for some time now. Sadly a hospital visit put paid to a review back then, so here we are now! I like to think I was excited about it for good reason. 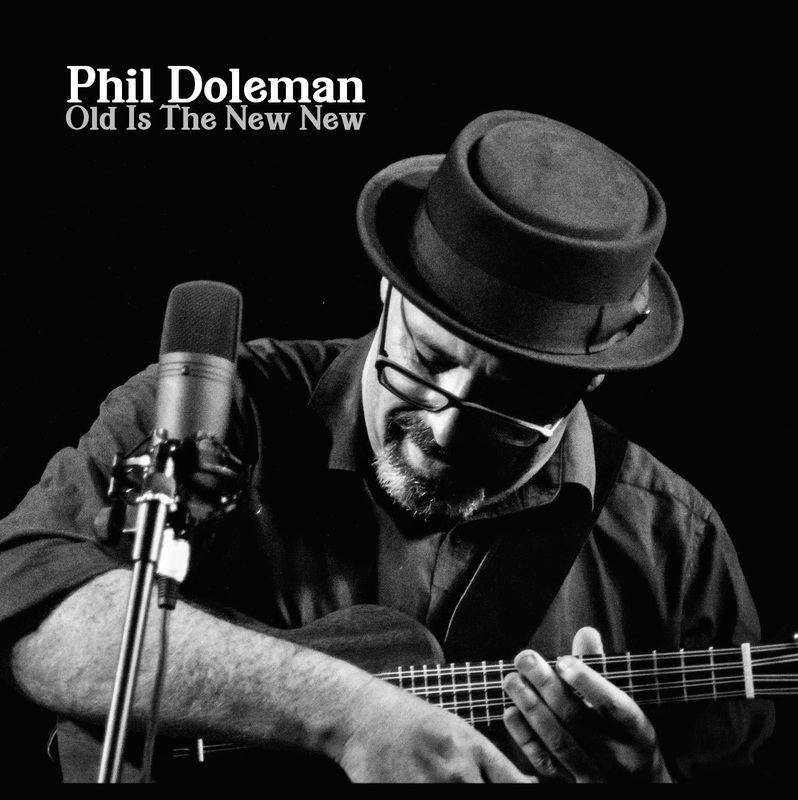 I'm lucky enough to have seen Phil perform live on numerous occasions, and plenty of times in 2014 performing his blend of old time jazz / rag and blues on ukulele all over the country. Looking at the CD, I saw he was including a few numbers I had seen him perform live and that had to be a good thing (seeing as I enjoyed the shows so much). 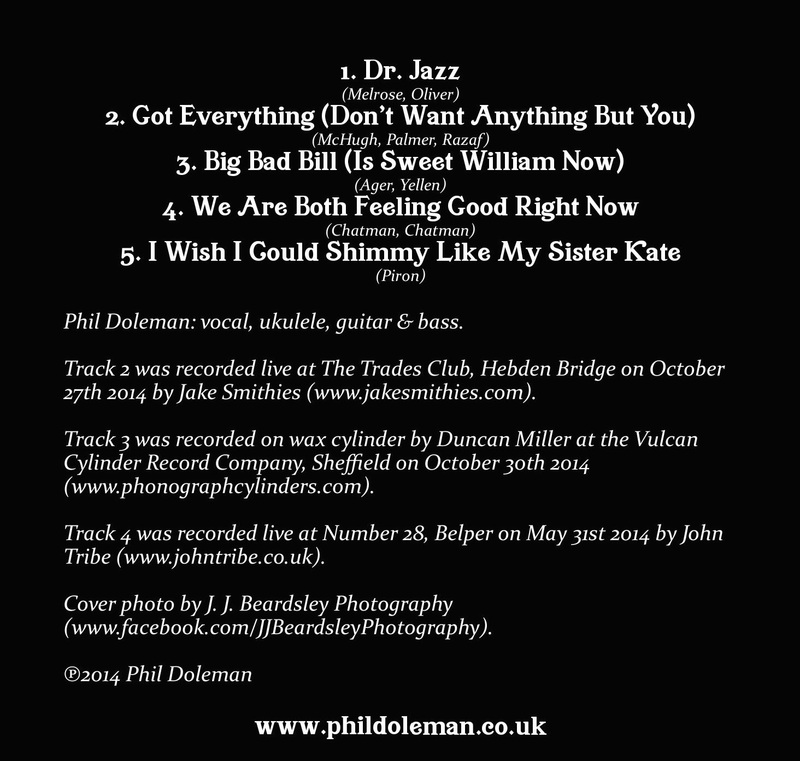 The CD /download comes in EP format, so just five tracks recorded by Phil and also includes some live stuff. Now, is it just me who likes the fact that the concept kind of harks back to my beloved jazz vinyl records which would often include live takes? A sample of the show experience if you will. We open with a studio number that I've seen Phil play live many times, and one that I think he always looks happy to be playing. Dr. Jazz by Melrose and Oliver. It's recorded brilliantly and a perfect taste of things to come. He puts a real bounce into this one! I was then pleased as punch to see inclusion of a live version of a track I always really enjoyed seeing Phil play live - Got Everything ( Don't Want Anything But You) recorded live at the Hebden Bridge Trades Club by Jake Smithies. Often referred to that 'dog and cat song' (perhaps just by me?!) but it gives you a real flavour of 'live Phil' in your pocket. Track 3 is a really interesting one - particularly since before release I saw photos of Phil recording into some old looking contraptions! For 'Big Bad Bill' Phil took himself off to Sheffield to work with Duncan Miller at the Vulcan Cylinder Recording Company to record a track to a vintage wax cylinder. Would it work? Well the clear answer is yes! This could not sound any more vintage - complete with compressed vocals and wax crackles. It's a really clever idea and gives a great old time feel to the EP. We have a another live track in 'We Are Both Feeling Good Right Now' recorded in his beloved home town of Belper at Number 28 and the EP closes with the ukulele players favourite of 'Wish I Could Shimmy Like My Sister Kate.' Uke players take note - most club renditions of this tune seem to be flabby and slow to me (my own included) but if you want to take tips on delivering this with some verve and swing you need to listen to this version! Nice bass in the background there too, and is that a guitar I hear? Throughout you are hearing some serious uke talent, but more than that - a man who clearly enjoys making music and nodding his hat to the jazz heritage. So in my absence I had luckily put MP3's of these on the iPod not knowing I would come to rely on that device whilst trapped in hospital. They worked wonderfully, and I found myself sat staring at the walls with a smile on my face. I think my comment above on the second track sums this one up the best I can - an EP of Doleman performance for your pocket! If you have enjoyed him live, this really is a no brainer to take him on the road with you! My only gripe? It's just an EP - more please Phil!! I just bought the songs through CDBaby thanks to you! It was a great buy. I appreciate each song because they each had something unique to offer. Dr.Jazz takes me back to the music I love, which is Jazz from the 1940's. I could imagine how amazing this would sound with accompanying drums and bass lines. But the uke definitely gets the job done. I really like what Phil did with "Got Everything", particularly when he speeds things up haha. I love the fast tempo music since it's a big part of my culture. Big Bad Bill sounds great! Reminds me when TV was in black and white (although this was way before my time). You've got great taste Barry.